Popular Hollywood entertainment movies pertaining to golf can be classified in various categories: ‘Caddyshack’ and ‘Happy Gilmore’ are comedies; ‘Tin Cup’, ‘Dead Solid Perfect’ and ‘The Legend of Bagger Vance’ are fictional novelettes, while the ‘Greatest Game Ever Played’ and ‘Follow The Sun’ are historical accounts. 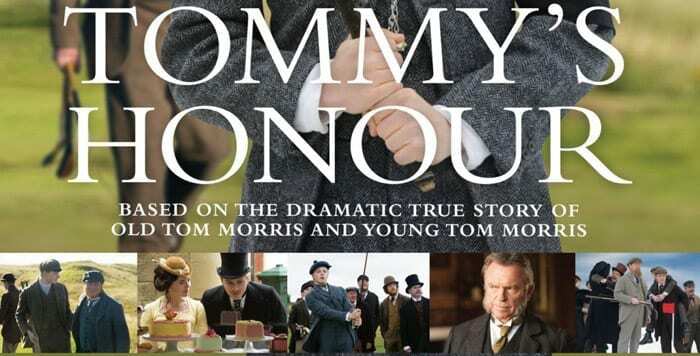 The next great entertainment movie concerning golf is also historical, as “Tommy’s Honour” highlights the career and life of Young Tom Morris, the fourth golfer ever to win the British Open. This movie was co-produced by Highland Park resident, Keith Bank. In an interview with Chicago Golf Report, Keith Bank outlined his participation in the making of “Tommy’s Honour.” Keith Bank, age 57, was born in St. Louis, MO, but has lived on Chicago’s North Shore for the past 30 years, most recently 20 years in Highland Park. As a businessman, Mr. Bank is the founder of KB Partners, LLC, a venture capital firm. As a golfer, Keith played golf occasionally as a 10-year old at Ruth Park Golf Course just outside of St. Louis, but then stayed away from the game until his late 20’s when he moved to Illinois. Our North Shore area’s offering of championship golf courses enabled Keith to redevelop a passion for the game and to hone his golf skills. With his current handicap index solidly set in the single-digits (7.0), Bank has played nearly every one of the top-100 courses in America, and a vast majority of the worldwide top-100. Presently, Mr. Bank is a member at Conway Farms Golf Club, the Scottish links inspired design of Tom Fazio. It may be a small possibility that the nature of his home course at Conway Farms triggered Keith’s interest in funding a movie about a long past Scottish golfer, Tom Morris, Jr.
Bank is one of four producers, and one of two executive producers of the movie, “Tommy’s Honour.” A friend of Bank’s, Jim Kreutzer is the other executive producer; Kreutzer is also a North Shore resident. Kreutzer has an extensive background in the movie industry, and it was Kreutzer who convinced Bank to select Jason Connery to direct the film. Connery? Scotland? Yes, Jason is the son of actor Sean Connery. After first talking about the idea of a film about Young Tom Morris, some three and one half years ago, pre-production time was two years. The film, based upon the book by Kevin Cook, was shot entirely in Scotland at 20 locations over a period of just 33 days. Among these 20 locations were several different ‘real’ golf courses and a two-hole ‘fake’ course constructed on a cow pasture in Balcarres, Fife, in southeastern Scotland. The two-hole course was intentionally built to period-correct golf standards. Short, square metal flagsticks appear on small ‘bumpy’ greens. Factoid: Did you know that Young Tom Morris was the inventor of the golf bag? Up until the mid to late 1860’s golf clubs were carried in bunches under the arms of the caddies who were employed by the ‘gentlemen’ golfers at the club (course). As depicted in one of the scenes in “Tommy’s Honour”, Tom Morris, Jr. plays an exhibition golf match against an archer. Young Tom notices that the archer’s arrows are carried in a quiver, and hatches the idea that golf clubs could be carried in a similar manner. Young Tom brings a quiver to his father’s golf shop and says to Old Tom Morris if you sew together something like this ‘the caddies will love you’. The American premier of “Tommy’s Honour” will take place on April 14 in 30 cities across the country including Chicago. On that day in Chicago, multiple screens of AMC and Regal Theatres will host the debut. Filmgoers will have a ‘theatrical window’ of approximately 2 to 3 months to catch the film on the big screen. Roughly six weeks after the close of the theatrical window, the film becomes available on PPV, which then is followed by the release on DVD. Approximately 29 months after the theater debut, “Tommy’s Honour” will be aired on the GolfChannel from 2019-2028. Bank believes that his tale of Young Tom Morris will solidly resonate with a core audience of avid golfers, but at the same time will be appealing to non-golfers; it will captivate an audience of both men and women, and hold the interest of millennials, generation-x, and baby boomers alike.